Michael nodded. "But what if the planes never flew again? What if crossing the Atlantic suddenly became much more difficult? What if choosing London really did mean choosing it, once and for all?" Harriet was sure that she herself was alive. The kitchen floor was still dirty--what more proof did she need? Harriet had spent a large part of the past two years online--doing what, she was never quite sure, given the way time contracted on the internet. She monitored news stories and had become fascinated with the way that certain stories started as tiny specks but then became huge sandstorms, like the way a young man immolating himself in Tunisia became the Arab Spring. Landing Gear is about a woman who wants more out of life, the husband she and her son seldom see because of his working hours, the teenage son who is ignored so thoroughly that he's falling deep into marijuana use and how their lives change when a Pakistani man, Yacub, falls from the landing gear of an airplane onto the hood of the mother Harriet's car. There are several inciting incidents in Landing Gear and it bounces around in time a bit, so it can be confusing. But, one of those events is the eruption of Eyjafjallajökull, the Icelandic volcano that shut down air travel in Europe for 6 days in 2010. Another is Yakub's search for a job with decent pay. There is a young lady named Emily who is searching for her mother, Harriet's desperate ploy to improve her career, teenage Jack's search for friendship and meaning, Michael's confusion when he's stuck in New York and decides he will be more comfortable waiting out the travel delays in his native Canada. All these threads eventually come together to lead to the creation of a wacky new family in which everyone is happier than they were before they went through the hardship that forced them together. This is actually one of my favorite types of books. I love stories in which a unique set of characters end up forming an unorthodox family unit. In this case, there is actually a core family to which other characters are eventually added, which is a little different than the typical "lonely people thrown into circumstances that unite them in a common bond" but it doesn't matter. What matters is that there is a set of characters who are all struggling and in some way their acquaintance makes life better for each of them. The biggest problem I had with the book is the fact that the author begins the book by describing Yacub's fall from the sky and then backtracks to describe how the characters arrived at those various turning points that threw them together. It's massively confusing, at first. I kept flipping back and forth, trying to figure out when each of the events occurred. I loved the inciting events, though, because they were so unique. This is the first time I've read a book that described what it was like when the planes stopped flying in England and how it felt to be stranded due to a volcanic eruption. And, then there's the fact that much of the book takes place in London -- my favorite city and definitely one of my favorite book settings. Highly recommended with a timeline confusion-factor warning - Quirky characters, unique events and a fun setting made this book a delight. I was confused by the order of events in the same way the bouncing around in The Time Traveler's Wife baffled me. But, it's notable that you can be thrown for a loop by some aspect of a book like its timeline and still love a story. That's how I felt about The Time Traveler's Wife and it's also how I felt about Landing Gear. It was difficult figuring out the timeline but once I understood how everything fell together, I absolutely loved the story. I particularly recommend the book to readers who like a story about the creation of an unconventional family unit and to those who love a London setting. This is probably the weirdest way I've ever read a book and the story behind it is rather an interesting one. The short version: someone put me in touch with the author, who loaned me one of the 6 remaining copies of The Paramedics from his personal shelves and gave me permission to photocopy it for my own use. I returned the original to the author and put the copied pages in sheet protectors then snapped them into a three-ring binder. Jim Page died in 2004 so it's been quite some time since my first reading (and I'm pretty sure I didn't finish reading The Paramedics, the first time) but I was reminded of the book because my exercise time falls during reruns of Emergency! on MeTV and the author was a consultant for the TV show. 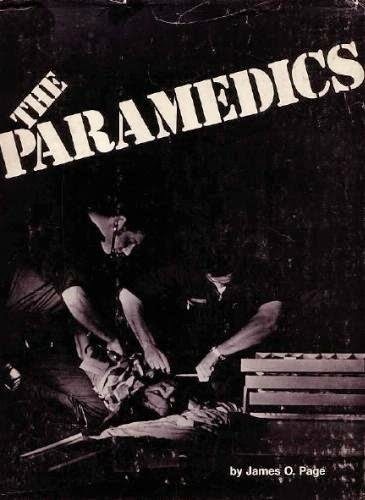 The Paramedics is a history of Emergency Medical Services in the U.S. The portions dedicated to the current state of emergency medicine in the field are well and truly outdated, of course, but the book is still of interest to anyone curious about how paramedics came into being. I first read The Paramedics in the late 90s and didn't remember a thing, so I found it surprising in many ways. Emergency medicine in the field (meaning, emergency response for needs of regular citizens, as opposed to the field medicine of military practice during war) really began as a response to the need for quicker cardiac care when cardiologists discovered that minutes could mean the difference between life and death for heart attack victims. Treatment expanded from cardiac care to other emergency needs, like trauma, as it became apparent that trauma was another area in which time saved lives. But, EMS was very much a regional thing -- both in method and level of training -- that varied dramatically from one place to another; and, it took quite some time before the creation of national standards. I found a few facts particularly fascinating. One is that most of the early paramedics were firefighters but in at least one case it was policemen who were the first EMS trainees and sometimes private ambulance attendants received training while cities or counties lagged behind. I also found it fascinating that some private ambulance services (previously burly men in white coats who merely loaded and carried patients to the hospital for a fee, like a cab service for the infirm) fought tooth and nail to prevent EMS becoming a branch of their local fire services because they feared a major loss of business. Eventually, it became apparent that private ambulance services could actually profit from switching to non-emergency transport, which was and still is needed. It was also interesting to find that the same problems that plague paramedics today (burnout, back injuries, abuse of the system by citizens who hoped for a free bus ride, so to speak) were a problem nearly from the beginning of EMS. There is a bit of background information about Emergency! in The Paramedics but the focus is on real-life events. I actually have a booklet that Jim Page wrote about the show, specifically, but I have no idea what's become of that. Recommended but almost impossible to find - A fascinating look at how Emergency Medical Services originated. The Paramedics used to be in hot demand amongst EMS professionals (I don't know whether or not that's still the case) but it's long since gone out of print and it is nearly impossible to locate a copy. I noticed there's one rating at Amazon. The reader says he bought his copy for $99 and sold it for $249. Whoa. And, his opinion was, "It was too much like it was screaming 'look at us'." The Paramedics was written when the whole concept of EMS was still a very new and shiny thing so I didn't really have any problem with that undercurrent of pride, although I do agree that Page was not a brilliant writer. He was solid enough, in my opinion, and the fact that he was present at the beginning gives the book a nice, personal touch. Also, where else are you going to find photos of paramedics wearing bushy mustaches and plaid pants? None of the following books were sent to me by publishers and none left a lasting impression, so I'm going to just give them quickie reviews. 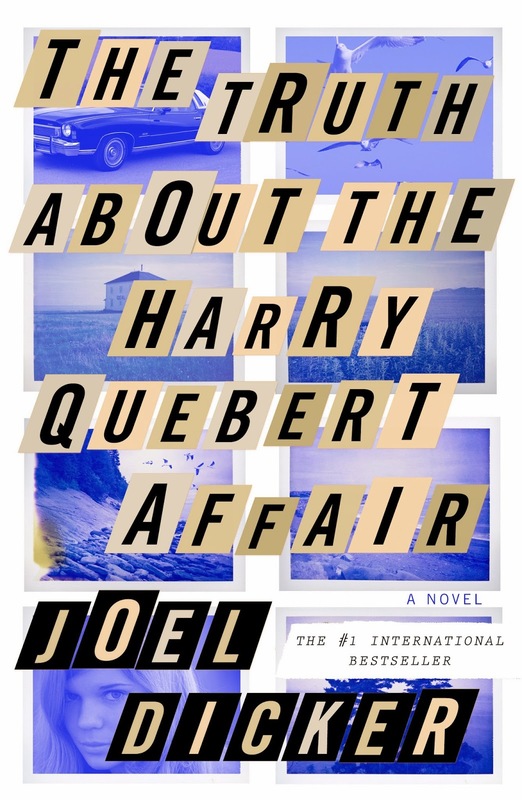 The Truth About the Harry Quebert Affair by Joel Dicker is a chunkster at 656 pages and I do believe it could have easily been edited down to a much more reasonable length but I still found it engrossing enough to finish within just a couple days. Harry Quebert is a famous novelist whose protégé, Marcus, has himself become a bestselling novelist. The deadline for Marcus's second book is looming and Marcus hasn't written a word, so he goes to visit Harry, hoping for inspiration. While visiting, Marcus becomes involved in a murder investigation. Decades in the past young Nola, the love of Harry's life, disappeared and now her body has been found with evidence that incriminates Harry. Marcus believes Harry is innocent and sets out to solve the mystery. I found the fact that both writers became fabulously wealthy very difficult to buy into and grew weary of Harry and Nola gushing about their love for each other. But I was captivated enough to ignore the book's flaws, whip through the reading and give it a 4-star rating, if for no other reason than the fact that I dislike mysteries, in general, so I figure if a mystery can hold my attention for over 600 pages, it ought to get an above-average rating. For the most part, the French author's understanding of Americans is pretty impressive, as well. The Truth About the Harry Quebert Affair is an award winner in the author's home country. Recommended, but you'll probably either love it or hate it. 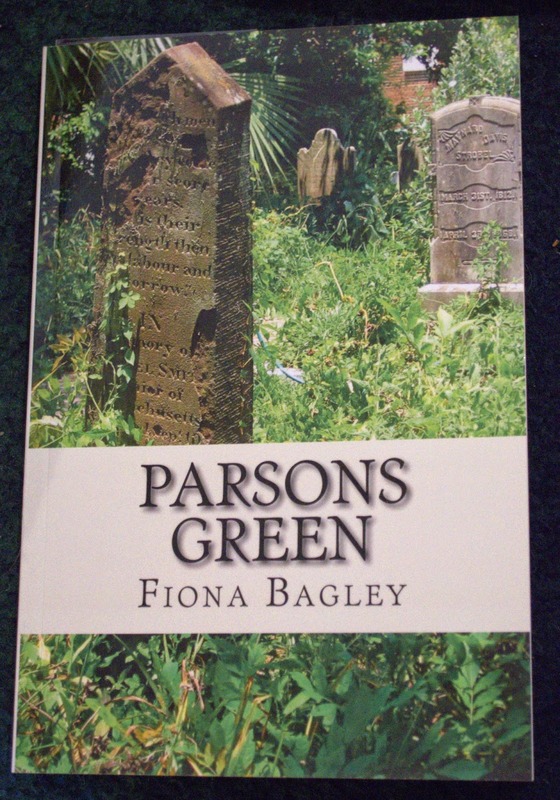 Parsons Green by Fiona Bagley was this month's selection for my F2F book group. Cricket McLean and her mother, Claudia, have always been able to see ghosts. Claudia is a travel writer and when she decides to spend a summer helping out in a friend's bookstore in Savannah, Georgia, she is not surprised to find that her rental house is haunted. But, at least the ghosts are friendly. Cricket doesn't want to spend all her time in the bookstore, so she goes out in search of a job and finds a position working as a tour guide in a local mansion called Chartwell House. There, a baby was murdered, the baby's mother found guilty and hanged for her crime. But, was she truly guilty? 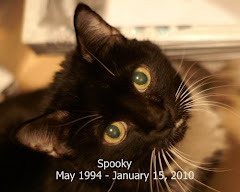 As Cricket explores the house and its history, she is able to see scenes that lead her to believe that there are dark forces at work and she must solve the mystery to put at least one ghost to rest. I thought Parsons Green was a pretty good story, apart from the fact that a few too many people believed in or saw ghosts. My biggest problem with it was the common self-published-book problem: Parsons Green is desperately in need of a professional editing job. Had the book been much longer, I probably wouldn't have made it all the way through the reading, but it's short and the story is compelling. Recommended with a warning that the sheer quantity of errors is exhausting. Goodnight June is the first book I've read by Sarah Jio, although I've been hearing gushy praise of her books for several years. June is a cut-throat New York banker whose job is to take over small businesses that are struggling and sell off their assets. 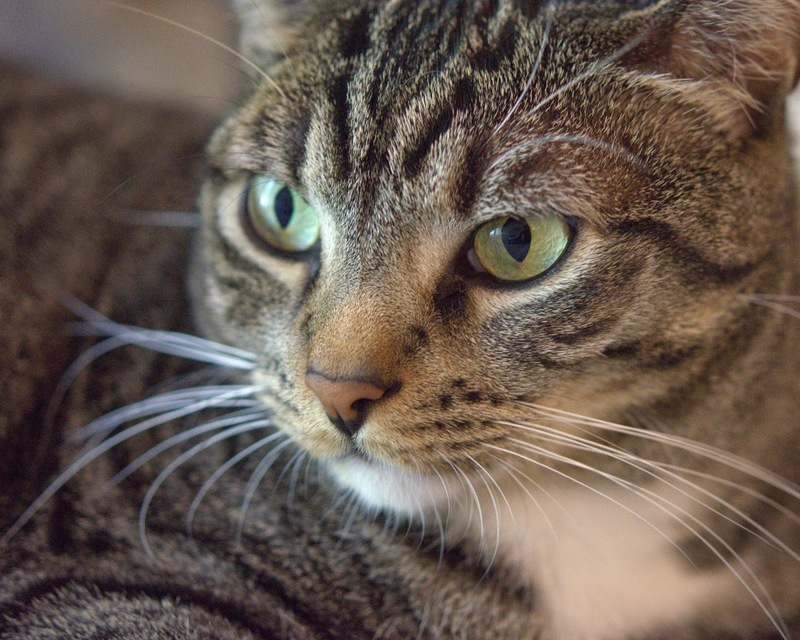 June moved to New York from Seattle and has not returned home for several years. She has few friends, no romantic prospects, and she works long hours. June is so stressed that as Goodnight June opens, she's in the hospital to get her blood pressure under control. She's only in her 30's. When June finds out her Aunt Ruby has died and left June her beloved bookstore, June travels to Seattle intending to simply sell the store and rush back home. 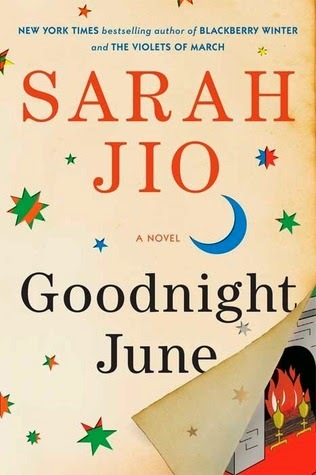 But, she meets a handsome restaurateur, finds a set of letters connecting the bookstore and her aunt to Margaret Wise Brown's book, Goodnight Moon, and decides she must stay to save the bookstore. The store is failing and June finds herself in the same position as the business owners whose livelihoods she has heartlessly ripped away. Goodnight June is fluffy, sentimental, beachy reading. It was the right book for the moment -- I was swept away, at first, and I enjoyed the fact that it was a quick read. But, it's more than a little far-fetched and the many strands had a "way too convenient" aspect that pulled me out of the reading. In spite of the fact that I had trouble buying into the storyline, I finished Goodnight June, so I gave it an average rating. Recommended for a fluff break with a warning that the story is extremely far-fetched. If you've already read Goodnight June, you might be interested to know that Margaret Wise Brown's New York writing cottage, Cobble Court, is under threat and may be torn down to make space for condominiums. Oh, looky there, another week has passed. That just keeps happening. You already know we had some rough days, last week, if you saw my Fiona Friday post. Otherwise, the week was not half bad. We're really enjoying having only one house upon which to focus our cleaning and gardening efforts. I've spent much of my week working on organizing the library and culling books that no longer interest me while Huzzybuns has been working hard at tidying the yard. Somewhere in there, Kiddo announced that he's officially completed his university graduation requirements, went on a job interview in Memphis, got a ticket for looking down at his GPS while sitting at a red light and then showed up on our doorstep. A few books arrived but it was a light mail week. Just three posts. So, not a wonderful blogging week. Not a particularly good reading week, either, but mostly because I was either falling asleep or worrying about the cat. I spent a lot of time checking on the cat and giving her extra cuddles while she was feeling bad. Sextant by David Barrie - I set Sextant aside to focus on The Transcriptionist, which is short but took me about 4 days to read because I kept falling asleep reading (again). Hopefully, I'll make some decent progress on Sextant, soon. I'm only on the 4th chapter. This is the Water by Yannick Murphy - One chapter in and finding the writing style bizarre. I absolutely loved The Call by this author so I'm going to stick it out, for now. 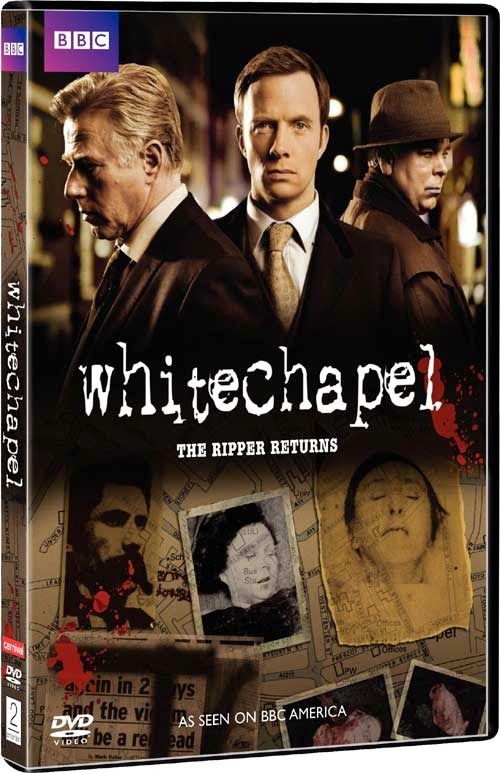 We're just a few episodes away from finishing Christopher Eccleston's season of Dr. Who and began watching the second season of Whitechapel, which is every bit as gruesome as the description led us to believe. And, yet, we really enjoy it. One episode was all we could handle, the first night. It really did make us cringe, a few times, but the interaction between DI Chandler and the other detectives is very well-written. I actually found myself sitting on the edge of my seat, literally. I admit to being captivated by the cut of Penry-Jones' clothing, as well. That jacket with the red silk lining! 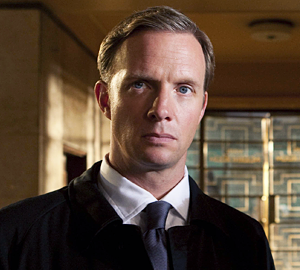 And, Rupert Penry-Jones plays a man who has OCD, which I can appreciate. If I could have my way, everything we own would be set at right angles. That's about all the news. I'll try to blast through more reviews, this week. Falling behind really gets on my nerves. What are you reading? Poor Miss Fi was given a shot she's not supposed to get ever because of a known allergic reaction, plus an extra injection she didn't need because she doesn't go outside. She had a rotten couple of days. Fiona is a high-energy kitty but she was just flat miserable and slept for the better part of two days, her neck badly swollen from the unnecessary injection, in spite of a shot of benadryl that was given to her when I realized what happened. I can't even begin to tell you how happy I was when she finally returned to her normal, bouncy self and resumed following me from room to room. It was a scary 48 hours. You should have heard the cries of delight when the envelope containing Tales of Trenzalore arrived. 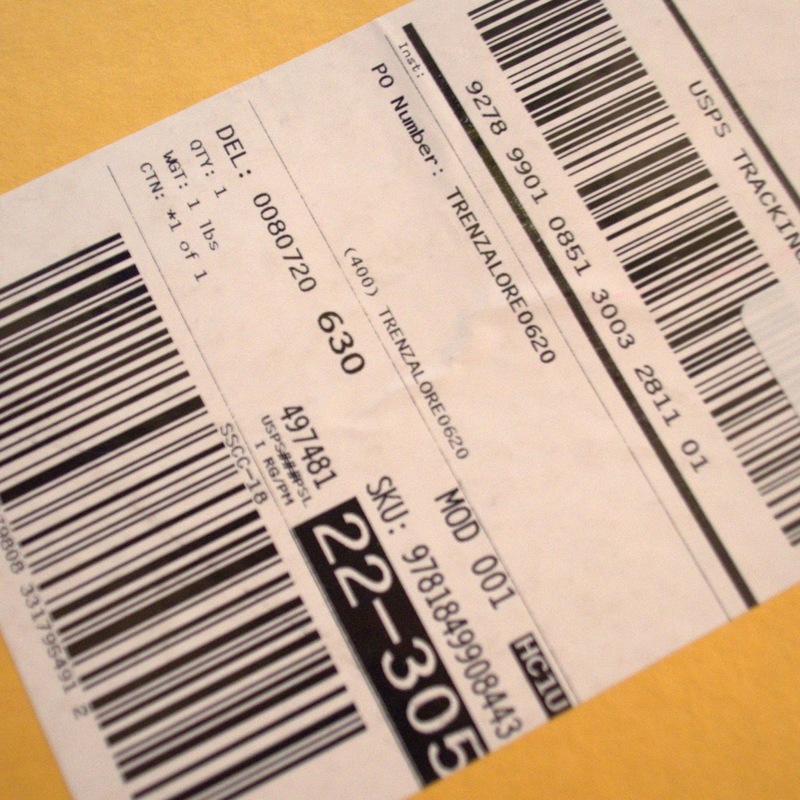 My son was in town, brought in the mail and noticed the unusual PO Number on his way in the door: TRENZALORE0620. Before we managed to open the parcel, we were busy theorizing whether or not a postal worker was just having a little fun. But, inside was Tales of Trenzalore and a lovely note saying the book was a thank-you gift for participating in last year's Dr. Who book tour. The whole family was bouncing up and down, by this point. We are Dr. Who fans from way back. I sat down and began reading, that evening. "Let it Snow" - Warriors fall from the sky in ice capsules to wage war against the Doctor and they don't mind killing anyone who gets in their way. "An Apple a Day"- The Harvest Festival is coming to Christmas but there's a hole in the roof of the orchard. Nearby, a man who used to be quite nice is now covered in vines and growing huge and dangerous. "Strangers in the Outland" - The Doctor takes an ice ship to the wilderness to battle the Nestene (nasty plastic creatures). "The Dreaming" - Hmm, I remember something about a skeleton and the Mara but this story escapes me. 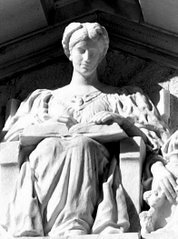 However, in flipping through the book I noted that the Doctor uses the word "squillions", which is a word I've used since reading it in the book Mr. God, This is Anna (decades ago -- squillions of days have passed) and seldom see used by others. Within days, I read another book in which the word was used. Well, it surprised me, that's all. Although I don't recall that last story very well, I enjoyed all four and I'm sure Tales of Trenzalore will end up battered as the rest of the family members take turns reading it. We do love Dr. Who. The only complaint I have is a minor one. Since the book is an anthology, the stories were written by 4 different authors and at the close of "An Apple a Day," the story ends with the Doctor saying, "Today I'm going to tell you the story of how I lost my leg . . . " Unfortunately, I thought of that ending sentence as a lead-in to the next story and it was not. The story of how the Doctor ended up with a wooden leg remains untold, at least in any detail. I would have edited that sentence so that it didn't confuse the reader into believing the actual story was about to be told. 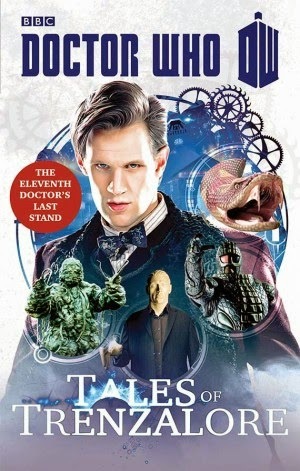 Recommended - Four entertaining stories about the 11th Doctor's adventures on Trenzalore, Tales of Trenzalore makes a nice, quick afternoon or evening read when you're in the mood for otherworldly tales. I have particular favorites, of course, and I thought some captured the 11th Doctor's unique mode of speech and gesture better than others but I enjoyed them all. I'm Not Cute! 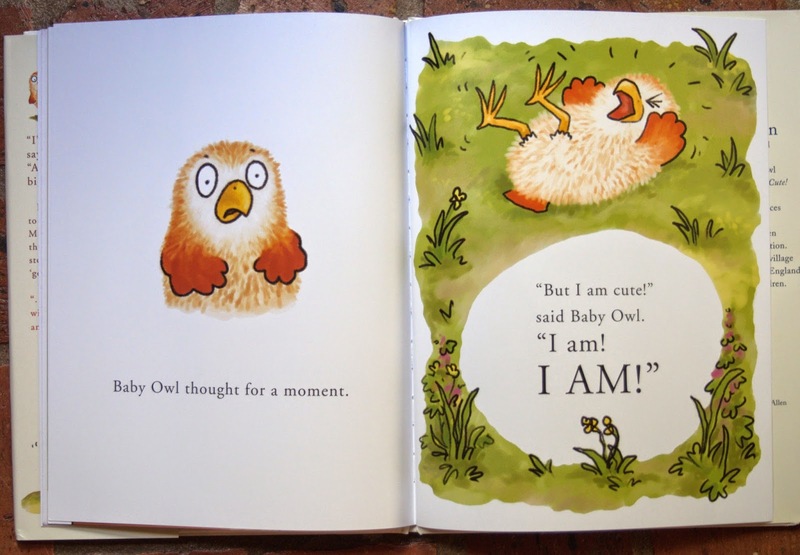 is about a baby owl who doesn't want to be thought of as a cute little thing as he thinks himself a grown-up owl. Hopefully, you'll be able to enlarge these images. Baby owl decides to go for a walk in the woods where, "Nobody will bother ME," but he comes across Rabbit, who says he's "so cute" and "so small" and gives him a hug. Baby Owl insists that he's a "huge and scary hunting machine with great big soft and silent wings." But, Fox comes along, sees him doing what Fox thinks is a little dance and calls him "so cute and so fluffy". Baby Owl gets another hug. The same thing continues with Squirrel admiring his cuteness and his "big baby eyes." Baby Owl throws a tantrum but along comes his mother, who listens to his complaints about being called cute and agrees with him. 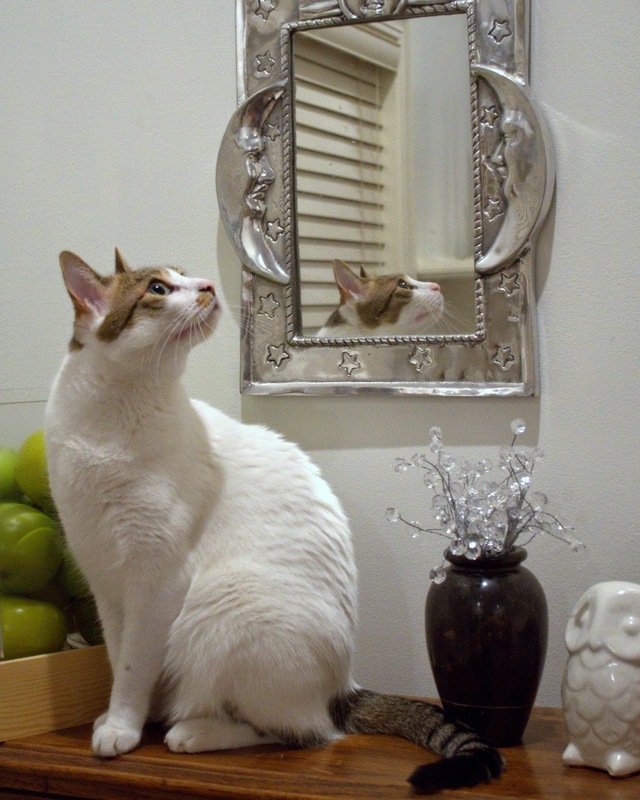 Clearly, he is a "huge, scary, sleek, sharp-eyed hunting machine." Naturally, the reverse psychology leads to a small crisis in which Baby Owl decides he really is cute. His mama sympathizes, tells him it's bedtime and reads till Baby Owl drifts off to sleep. She whispers that he's awfully cute for a huge, scary, sleek, sharp-eyed hunting machine. Baby Owl has one eye open but closes it with a smile on his face when she wishes him good night. My thoughts: Anyone who has had or worked with a toddler or preschooler going through that phase during which they can't accept the fact that they're not yet grown-ups but still want the comfort of being coddled by an adult will relate to this story and enjoy reading it to a little one. And, the little one being read to will probably get a kick out of a little owl sharing his or her feelings. Recommended - A good story that little ones can relate to with adorable illustrations. I love the fact that I'm Not Cute! shows both sides of the story. Sometimes a little one wants to be treated like an adult but at other times they just want to be loved, cuddled and babied. It's Monday! First things first . . . the mail. I thought I'd gotten away with a really light mail week and then Huzzybuns fetched the mail on Saturday and I wanted to slink behind the wall when he came in with two thick parcels. Fortunately, I made up for getting a nice stack by sending two full bags of books out the door for donation and mailing out a few more. That's some colorful mail I got, last week, isn't it? Bitter Greens by Kate Forsyth - from St. Martin's Press for review. I actually squealed when I got this one. It's been on my wish list for ages. Annihilation by Jeff Vandermeer - I decided to give up on Annihilation because every time I picked it up I fell asleep. And, it's due back to the library soon. I may try it another time but it definitely was not the right book for the moment. I also read just a few pages of Citadel by Kate Mosse before deciding I'll return to it later, as well. After we finished watching Whitechapel: The Ripper Returns (which had a very satisfying ending), we considered moving on to the next season of Whitechapel but noticed the word "gruesome" in the description, looked at each other and both shook our heads. Another day. 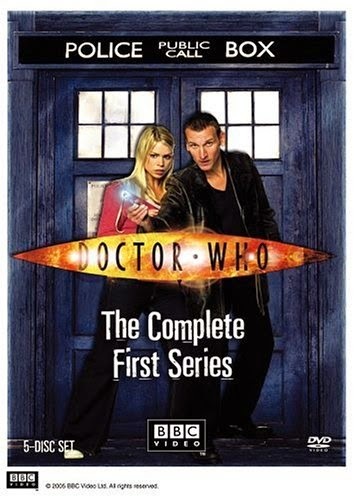 I wanted to restart Dr. Who from the beginning but Husband was not interested so we randomly flipped channels and then I began watching the Christopher Eccleston season when the spouse wasn't around. I've watched 5 episodes, so far, and I'm enjoying myself. I just squeeze in an episode or two whenever I'm on my own and not in the mood to read. So far, so good. I'm looking forward to Captain Jack's appearance and this time I've noticed at least 3 of the Torchwood team made an appearance in this first season of Dr. Who, not just Captain Jack but two of the women, as well. Interesting what you notice on repeat viewings. Isabel can't help herself. She just loves to cuddle up with her sister or, at the very least, stick a paw or two on her back. Fiona is okay with Izzy's affection on occasion but at the moment I snapped this photo she was on the verge of taking off. 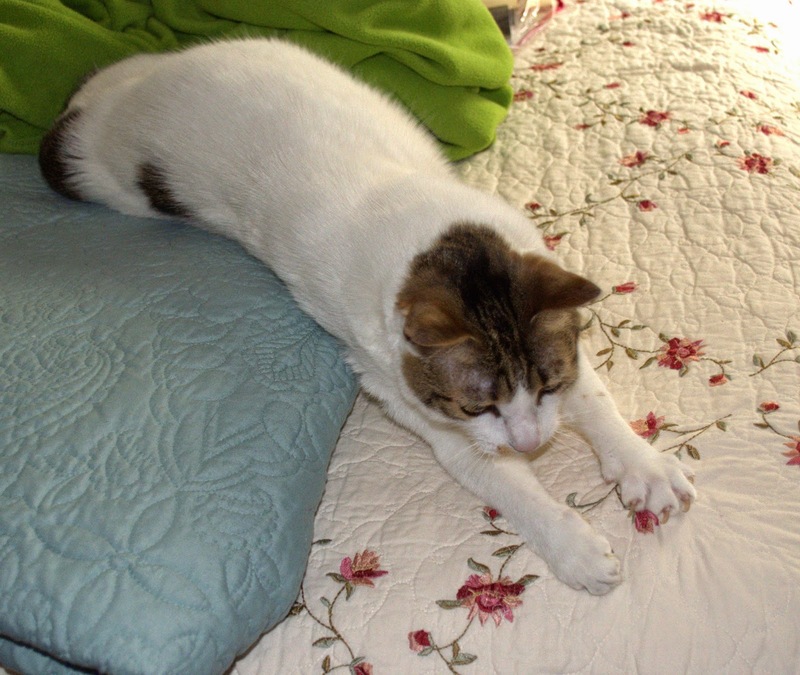 Isabel was clearly dismayed at the loss of her paw-warmer. 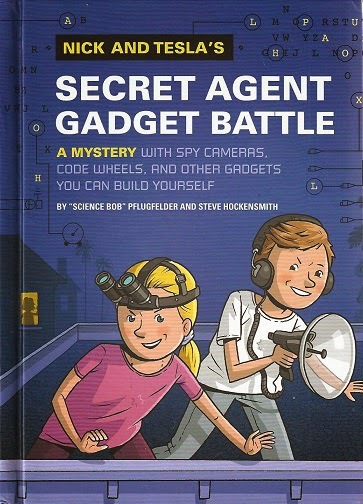 Nick and Tesla's Secret Agent Gadget Battle is described on the cover as "A mystery with spy cameras, code wheels and other gadgets you can build yourself." It's the third in the Nick and Tesla series and, so far, my favorite. In Secret Agent Gadget Battle, Nick and Tesla receive a partial message from their mother, telling them they're in danger from a spy. Tesla is relaxed and calm about the message, thinking of ways she can try to identify the spy while Nick's imagination runs wild, everyone around him suddenly appearing to be a threat. With a repairman, two house cleaners and an assistant to Uncle Newt in the house, there are plenty of potential spies to eliminate. When Tesla's pendant goes missing, the kids become serious about figuring out which of the invaders is the spy. Using code wheels, spy cameras, Nick's own pendant (to tempt the spy-slash-thief) and fingerprint powder, Nick and Tesla work to figure out who is spying on them and eliminate the danger to their lives. Highly recommended - While the writing in the Nick and Tesla series can be grammatically awkward at times, I love the books for the adventure, the humor and the hands-on science activities. Nick and Tesla's Secret Agent Gadget Battle is my favorite in the series, so far, because it has an interesting cast of potential spies that kept me guessing and some of the dialogue had me chuckling. I particularly loved the interaction between Nick and Tesla at the beginning of the book, when Nick is so nervous that he suspects absolutely everyone. A very entertaining installment in an adventurous series. It was snowing when I got off the bus at Flax Hill. Not quite regular snowfall, not exactly a blizzard. This is how it was. The snow came down heavily, settled for about a minute, then the wind moved it -- more rolled it, really -- onto another target. One minute you were covered in snow, then it sped off sideways, as if a brisk, invisible giant had taken pity and brushed you down. As for Flax Hill itself, I was on shaky terms with it for the first few months. Neither of us was sure whether or not I genuinely intended to stick around. And so the town misbehaved a little, collapsing when I went to sleep and reassembling in the morning in a slapdash manner; I kept passing park benches and telephone booths and entrances to alleyways that I was absolutely certain hadn't been there the evening before. It was a windy morning, and the wind pushed me, and the road dragged me, and the tree branches flew forward and peeled back and broke away, and their scrawny trunks hugged each other. Imagine having a mother who worries that you read too much. The question is, what is it that's supposed to happen to people who read too much? How can you tell when someone's crossed that line? I have a relationship to Boy, Snow, Bird similar to the heroine's feelings about Flax Hill at the beginning of the novel, a bit shaky. As usual, I went into the reading without bothering to learn much beyond what I'd read at the time I accepted the book for review and mostly forgotten by the time I opened the book. I did know the title was a list of character names and I was aware of the basic storyline. 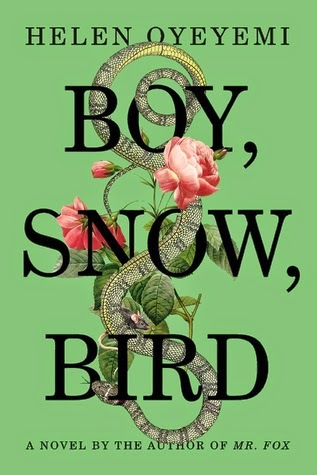 I'm not entirely sure what I expected of the book but the description of young Snow, with her dark hair and lovely skin, and the book jacket comment describing Boy as an evil stepmother made it clear that Boy, Snow, Bird was in some way based on "Snow White". I have a feeling I was anticipating something a little magical, a bit dreamy with elements of fantasy. That may explain my disappointment. Warning!! This review may contain spoilers. Skip down to the recommendation line (highlighted in bold) if you are concerned. Boy is the name of the protagonist, an abused young lady whose father is a rat catcher in New York City. She knows nothing at all about her mother, only that her father is angry and dangerous. Although a young man named Charlie loves her, she escapes the city as soon as she's able and ends up in Flax Hill. There, Boy eventually falls in love with and marries Arturo Whitman, the father of beautiful Snow, a girl with thick, beautiful hair and dark eyes who instantly charms everyone. When Boy gives birth to their daughter, Bird, the Whitman family's secret comes to light. They're pale blacks living as whites. Bird is clearly a black child and Boy is blonde and fair. Boy sends Snow away, I presume because she can't bear the contrast between the two children. That was never entirely clear to me. I also never quite understood why Boy rejected Charlie, a man who truly loved her and went out of his way to show her how much he cared, for Arturo, a man whose affection was lukewarm at best. There was a moment I thought the author tried to explain it away but I just couldn't wrap my head around the concept. Did she feel like she didn't deserve Charlie? Was he too much a part of her early life? I just don't know. The book is written in three parts and the first portion, between descriptions of the rat catcher and the abuse of Boy, almost convinced me the book was not for me. And, yet, now and then a strange, beautiful or just unusual sentence would jump out at me and the uniqueness of the author's style kept me going. Unfortunately, I really feel like I would have been better off not finishing Boy, Snow, Bird. The second section's tenor was entirely different as the viewpoint changed from Boy's to Bird's. The beginning had made my skin crawl at times and unsettled me, yet there were sparkling moments. The second section was flat and lifeless. The third is just bizarre, as a plot twist involving a transgendered character is tossed into the mix and then . . . the story ends. In some ways, I felt like I "got" what the author of Boy, Snow, Bird was trying to accomplish. I understood the theme: The color of your skin changes the way people view you. But, I was disappointed that what began as uncomfortable yet oddly intriguing writing degenerated. And, I am completely clueless about the purpose of the transgendered character. Does the fact that the character is transgender change how Boy felt about that person? I think so. But, because the trans element was tossed in like an afterthought, even treated as if the change of gender were a mental illness as opposed to realistic feelings of gender identity, the ending just left me with question marks hanging over my head, tickling my skin. I felt like I had to brush them off my arms and step on them, then move immediately to another book to cleanse my mind. I also think the cover description of Boy as an "evil stepmother" is misleading. She doesn't mother Snow at all; she just sends her away. Neither recommended nor not recommended - I gave Boy, Snow, Bird a 3-star rating but I've waffled over whether or not that was too high. My general feeling upon closing the book was, "What the hell was that?" I got something out of the story and yet I was confused and irritated by the ending. I think at the time I closed the book I felt like the beginning held too much promise to give the book less than an average rating. And, yet, since the ending was so immensely disappointing, I wonder if that may have been a mistake. Either way, I don't feel like I can give a recommendation or tell you to avoid it. There is something unusual about Helen Oyeyemi's writing. While I didn't love this particular story, I would not avoid her writing in the future. There are hints of possibility that are not to be ignored. Cover thoughts: I love the cover. The background color and juxtaposition of evil and good images (snake and rose - probably to represent Boy's treatment of Snow and Snow's innocent whimsy) make for a dazzling combination. Because I'm gettin' old: I noticed one historical anachronism. Boy arrives at Flax Hill in 1953 and within a decade or two, one of the characters refers to a Mr. Chen as "Asian" rather than the word we used in my childhood, "Oriental". Seeing mistakes like that makes me panic about my own writing. It must be difficult to get everything right when writing historical fiction. 1953 wasn't even all that long ago, although -- just so you know -- it was before my lifetime, thankyouverymuch. Twofers = Two for the price of one, aka two mini reviews. 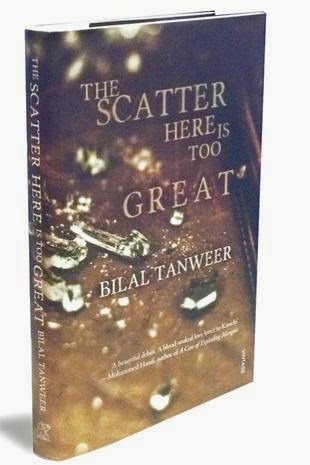 I'm jumping the gun a bit, here, as The Scatter Here is Too Great doesn't release till mid-August. But, I want to write about it while it's still fresh in my mind. I took The Scatter Here, etc. with me to New Jersey because it's a book of short stories and I've found that when traveling short stories can be excellent for those stop-and-go moments when you can't sit still long enough to read an entire novel. As it turned out, I had tons of reading time on vacation. My granddog and I had a terrific time reading together. The stories in The Scatter Here is Too Great are all set in Karachi, Pakistan and they're centered around a deadly bomb blast. 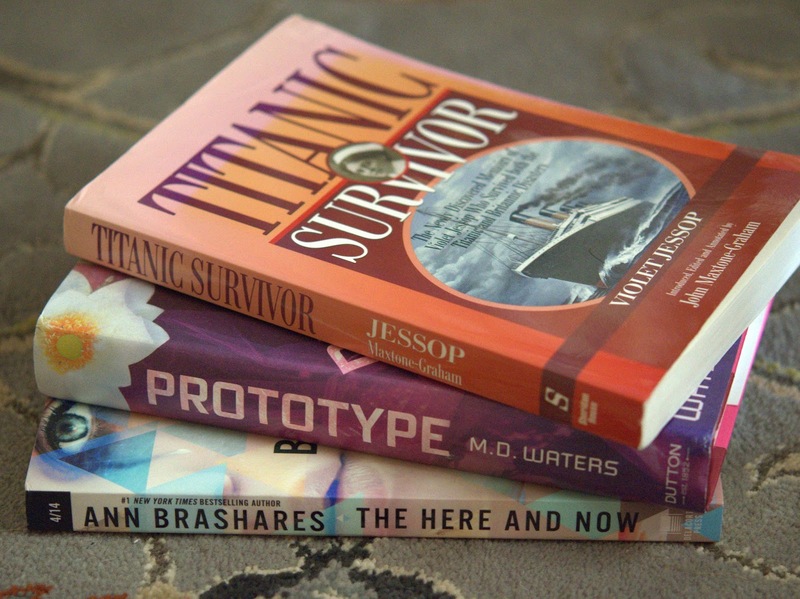 The author tells the same story from a number of completely different perspectives. And, in some ways they are interconnected -- the father of a character whose story you've read early in the book may appear later, telling his own version of the events, for example. Unfortunately, I found that the biggest problem I had with The Scatter Here is Too Great was in trying to figure out how the characters were connected. I enjoyed the stories, found the setting fascinating, liked the way Karachi was -- yes, I've read the claim that saying so has become a cliché -- a character in and of itself. I did think the setting had a life of its own, so I don't mind sounding a bit cliché. Once I realized that I was trying too hard to figure out those connections, I enjoyed the reading a lot more. In the end, though, because I wasted so much time trying to figure things out instead of just immersing myself in the stories, the book ended up being an average read. Recommended but not a favorite - Solid writing, vivid setting but I think the book would have had more impact without any character crossover, which I found bogged down the reading for me. 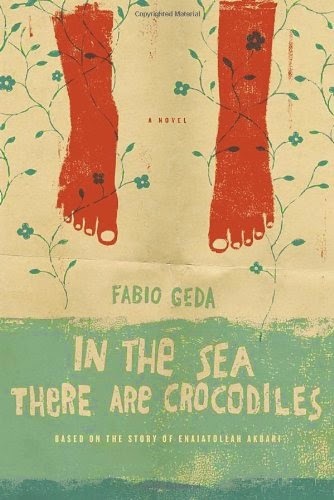 In the Sea There Are Crocodiles is the retelling of a child's escape (at the age of 10) from his dangerous home country. Even though the story doesn't take place anywhere near the North American continent, given the current immigration crisis along our American/Mexican border, I consider it relevant because of the similarities. A child in danger is taken from Afghanistan to Iran by his mother with the help of a a friend involved in human trafficking. At a mere 10 years of age, he must figure out how to survive and then keep moving from one country to another, seeking a better life until finally he reaches asylum in Italy. The story of Enaiatollah Akbari is told by an Italian novelist who tried to write the book as it was told to him. Although he admits that the details cannot possibly be perfect because Enaiatollah was young and reconstructing memories will always contain imperfect elements, it doesn't matter. The story has a tremendous impact because it allows the reader to view the unforgiving life of a refugee child as he is abandoned by a mother who loves him too much to even say "goodbye" then moves from job to job and country to country, from Iran to Turkey to Greece then finally Italy. Occasionally beaten, stolen from and "repatriated" to a homeland where he faces almost certain death, In the Sea There Are Crocodiles gives you an idea what it's like to be a child refugee dealing with human traffickers and people who aren't interested in giving a child asylum. In the Sea There Are Crocodiles has been translated from Italian to English (translator: Howard Curtis) and I think the translation is done well. There was never a point that I felt like I didn't understand what a particular sentence meant. It's told simplistically but it's a harsh story and not all books are told with lyrical beauty. I disagree with a reviewer who believes the book should be labeled YA merely because of its simple language. One must remember that it was told by a man whose first language is not Italian, written down as close as possible to the way it was related and then translated. Simplistic or not, it's a story whose horrors make it a very adult read. There are humorous and touching moments in addition to hardship, which helps keep the book from being an exhausting downer. Highly recommended - Especially relevant to Americans as our leaders are in the process of deporting refugees from South and Central America. An eye-opening story of what it's like to escape a life of terror, only to face hardship and deportation. I actually cried with relief when Enaia finally found sanctuary in Italy. Today is release day (July 15, 2014)! 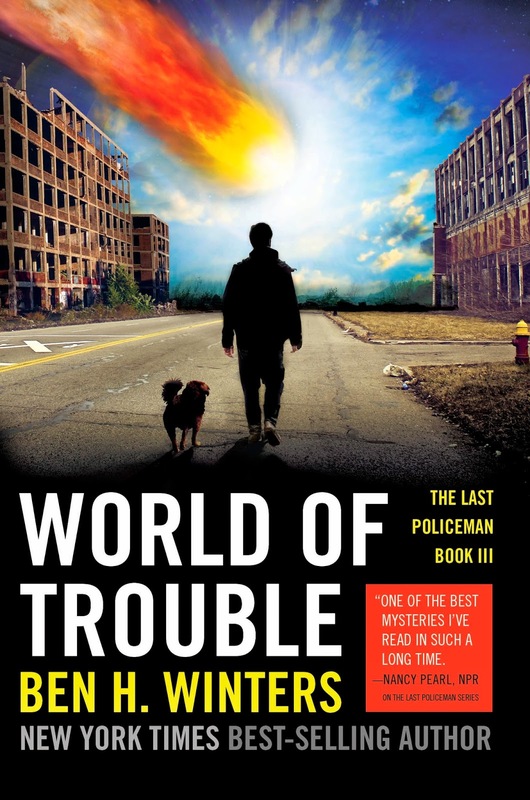 I didn't mark a single passage in World of Trouble because I was too busy barreling through the book, enjoying the reading and anxious to see how Ben Winters would end the Last Policeman series. The verdict: perfect ending. I honestly don't remember a single series I've ever felt was as completely satisfying as the Last Policeman series. And, World of Trouble is available today!! For those of you who have been eagerly awaiting release day, I suggest a lot of coffee because you'll want to read World of Trouble in one sitting. 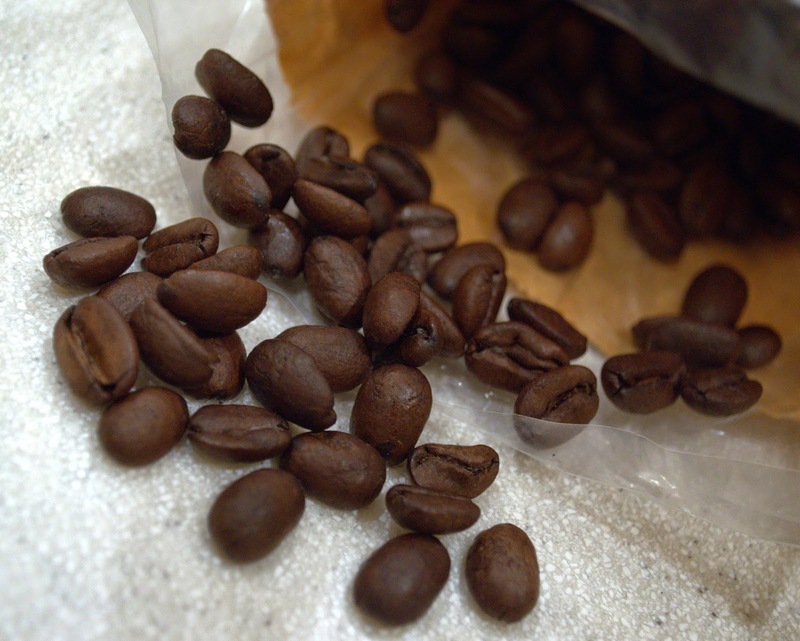 Plus, coffee is mentioned frequently enough that you might end up with a craving. In World of Trouble, only 14 days remain until the asteroid hits Earth. Hank Palace could have easily waited out the end with his friends in Massachusetts but he's determined to find his sister, Nico. So, instead, Hank traveled to Ohio, where he's been told the radicals Nico has been hanging out with have converged to wait for the man they believe will save them by shattering the asteroid. In Ohio, Hank and a traveling companion find two bloody knives, spatters of blood, a body and a clue to where the radicals may have gone into hiding. To find the missing group, though, he must track down a local man who does concrete work. With the clock ticking down, Hank tries to solve the crime and find his sister. Will he find Nico before it's too late? What will happen when Hank discovers the "body" has a pulse? Can he solve the attempted murder, uncover the mystery of what's become of Nico's friends and stay alive long enough to find out whether or not the world will truly end? Well . . . you'll just have to find out. And, I promise you it's worth buying all three books if you haven't already begun reading this series. Highly recommended - The Last Policeman series is absolutely hands-down, my all-time favorite series. I don't even like mysteries! But, I adore Hank Palace. I love his "just keep living life while you can" attitude. I love the moments of levity, the action, the author's wit. And, the ending is absolutely everything I hoped for and more. Great series, perfect ending, terrific hero, well worth owning. Soviet Ghosts by Rebecca Litchfield - purchase. I saw a sampling of the photos in Soviet Ghosts online -- a book of photos which were taken in buildings left abandoned after the fall of the U.S.S.R. - and found that it set my mind whirling with story ideas, so I pre-ordered it and I'm happy that I did. It's a fascinating picture book and I'm looking forward to reading about the author's experience, as well. 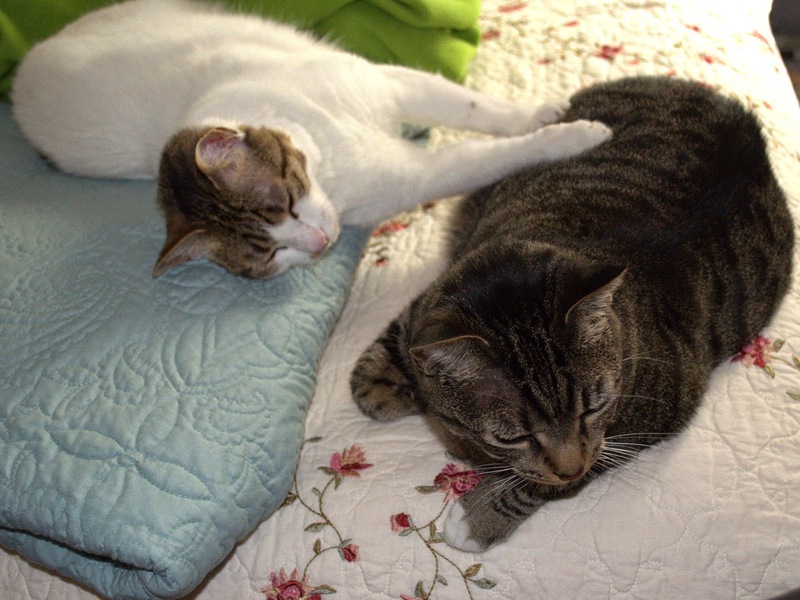 2 A.M. at The Cat's Pajamas by Marie-Helene Bertino - from Crown via Shelf Awareness. The cover is even prettier than it appears. Look how it puts every other book's cover to shame! Flying Shoes by Lisa Howorth - from a friend. 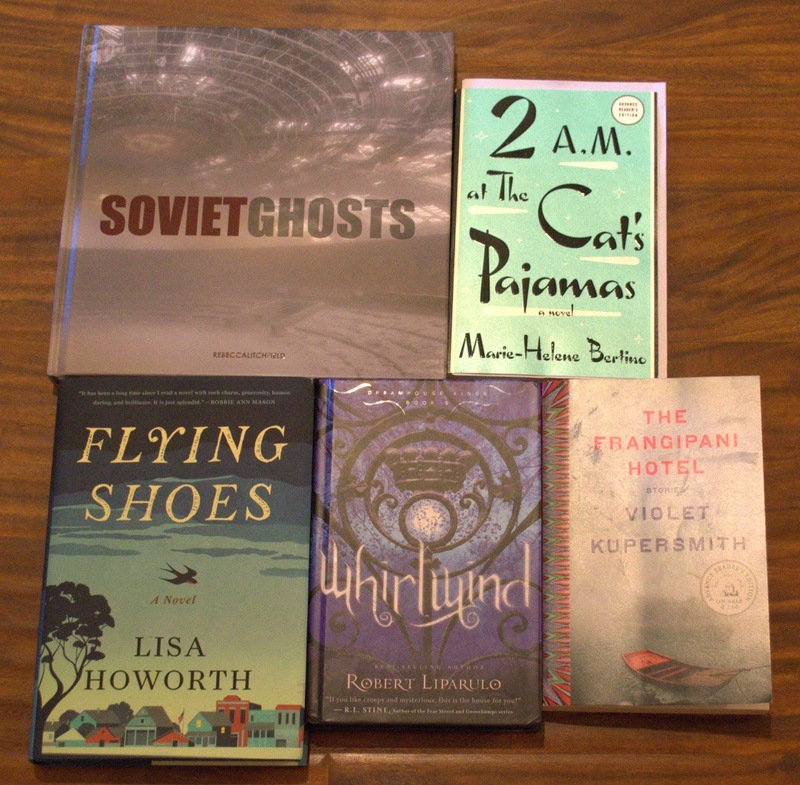 I'm very excited about Flying Shoes because Lisa Howorth is co-owner of Square Books in Oxford, our favorite indie bookstore in the state. I would have bought a copy at some point but Shannon saved me a trip. Thanks, Shannon! Whirlwind by Robert Liparulo - via Paperback Swap. I read the first book in the Dreamhouse Kings series eons ago and loved it enough to put all of the follow-up books on my PBS wish list. Unfortunately, it's taken so long to receive the books (and they didn't arrive in any particular order) that I'm not even sure which titles I own. Once we've emptied the remaining boxes of books we've not yet unpacked, hopefully I'll get that sorted and then perhaps I can reread the first book and move forward in the series. The Frangipani Hotel by Violet Kupersmith - sent by a friend. I hear there are ghosts. That's good enough for me. My thanks to Mandy for passing this one on! Annihilation by Jeff VanderMeer - Just started this one last night (a library check-out) after finishing The Half-Life of Molly Pierce. The Paramedics by James O. Page - Haven't gotten far on this one but I'm enjoying it; the history of emergency medicine is fascinating. Straight Man by Richard Russo - A good book but not the right one for the moment. I realized that I should probably move on after my Fiona Friday post, when I said I can only stand to read about two chapters of Straight Man at a time. After I said that, it occurred to me that if I feel like I can only read a little chunk at a time, it's probably not the book for me at this moment, whether it's a terrific read or not. I do love the hero but I'll read it another time. Apart from the usual Emergency! reruns, which I watch while walking on the treadmill, last week was a brain-dead, random-flipping week till last night. Then, I inexplicably returned to normal and looked up BBC productions. We ended up watching two episodes of Whitechapel: The Ripper Returns. 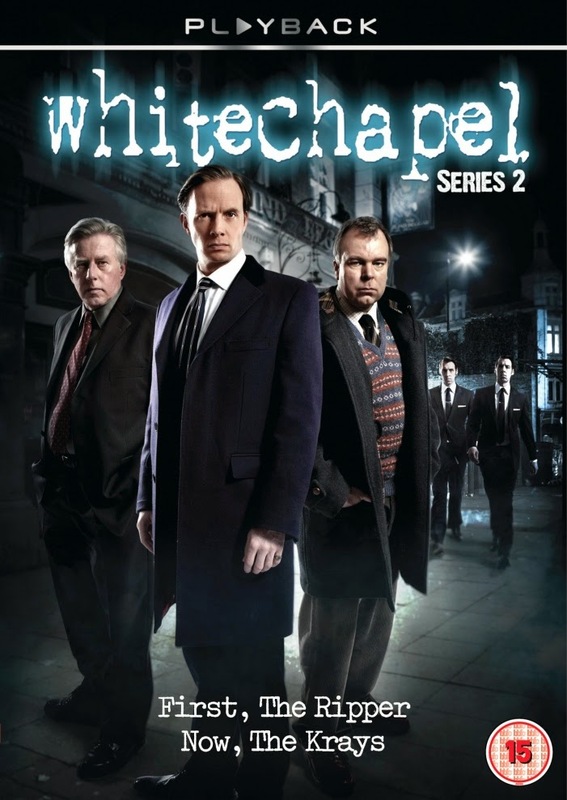 To be honest, it was Rupert Penry-Jones' face that made me hesitate long enough to read about the series. I'm not a big fan of mysteries but I like Penry-Jones and the husband nodded approval, so we gave it a go and ended up watching the first 2 out of 3 episodes. I think we were both surprised at how entertaining the show is. Penry-Jones plays Detective Inspector Joseph Chandler, who has been given his job mostly as a favor to his father. He's obsessive-compulsive and not particularly knowledgeable or qualified. The other detectives are sloppy but competent. Chandler forces them to clean up and tries to overlook their jeers when he puts his trust in a "Ripperologist" who believes the crimes they're attempting to solve are copycat crimes by someone imitating Jack the Ripper. As he becomes more immersed in the job and his competence rises, Chandler grows sloppier at the same time his underlings are spiffing up their wardrobes. Sometimes the images of murdered women can be gruesome, as you might imagine, but I think the creators of Whitechapel did a pretty good job of putting distance between the camera and the dead bodies and blurring things artistically enough to make the gruesome bits tolerable. Otherwise, I likely would not have made it through two episodes, in spite of the fact that Whitechapel is often quite humorous. I'm looking forward to watching the conclusion, tonight. And, hopefully, this will be a normal posting week as the "Just Finished" category in my sidebar has grown pretty intimidating. I don't want to leave cats out of Fiona Friday so you get Izzy x 2. Isabel climbed on top of the roll-top desk to watch an insect buzzing around by the ceiling. There's unfortunately no way we can get to insects in this house if they reach the ceiling because the ceilings are too high. So, both cats and humans watch them and do nothing. It's like a spectator sport. But, how cool is it that the hollow space was heart-shaped? Those of you who really know me as an individual probably realize I saw that as a sign. I admit to grumbling a little about having to spend money taking down a tree for someone else but when I saw that hole it made me realize we were fortunate that we were able to take it down before it fell on someone. And the heart shape just made me feel all warm and fuzzy inside. I loved that tree. Maybe the universe was telling me it knew, but the tree's time had come. For whatever reason, it was a heartwarming moment. The new owners are totally adorable and I know our old neighbors will love them. That was also nice to know. To be honest, this week has completely tapped me out. I have one errand, today, and then I may allow myself to just read the rest of the day. I've read bits and pieces of The Paramedics by James O. Page - my version being a photocopy of the book, which was sent to me by the author to copy because it's been out of print for quite some time (published in 1979) and he had a mere 6 remaining copies, which he wanted to hold onto. Jim Page died a few years after I copied his book and mailed it back to him. I don't recall if I finished it the first time I read it but watching reruns of Emergency! (the 70s cult classic TV show for which Page served as a technical consultant) reminded me of the book so I decided it would be fun to reread. I've also read about 58 pages of Straight Man by Richard Russo. It's an entertaining read but I have a feeling it will take me quite a while to get through because after about 2 chapters I feel like I need a break from it. 2 chapters a day? Yep, it might take some time. 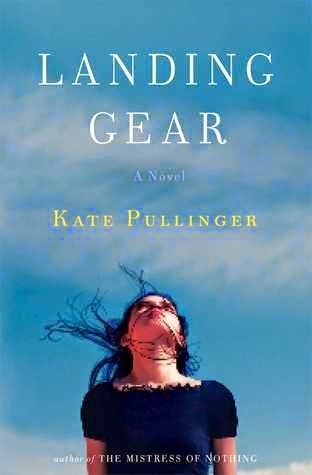 I just started reading Landing Gear by Kate Pullinger, last night, and on Wednesday I finished reading Parsons Green by Fiona Bagley. I think my F2F group meets to discuss Parsons Green next week. I'll tell you more about that book, later. It may take me a few more days to recover or I may dive back into reviewing this weekend. I really can't say. I am glad the closing is over, happy to have a second set of bills off my hands but more than a little surprised at how drained I feel. I think I must have been more stressed about the process of selling than I realized. I've read some great books and hope to be up to talking about them, soon. Wishing a Wahooey weekend to all! The year, she is flying by. Hard to believe we're already in the latter half of 2014. The following are my reads for the second quarter of the year. I deliberately skipped reviewing Fidelity by Grace Paley (a reread) and Outrageous Fortune by Anthony Russell (a book I found disappointing), but still plan to review everything else that lacks a link, including the Fact or Fib books and I'm Not Cute, both read at the beginning of May. Links are provided where applicable. It took me some time to get around to reading poetry in April for National Poetry Month, but when I got around to it I had a blast. I love poetry because it's challenging and thought-provoking, although admittedly I like poetry that has a clear theme better than poems that puzzle me. I'll often read and reread a poem to try to figure out what the author is trying to say when I don't get it, though. Favorites besides the poetry in April were Itch Rocks, 50 Children, The Storied Life of A. J. Fikry and How to Lose a Lemur. I also enjoyed The Accidental Caregiver, A Single Breath and The White Tiger. 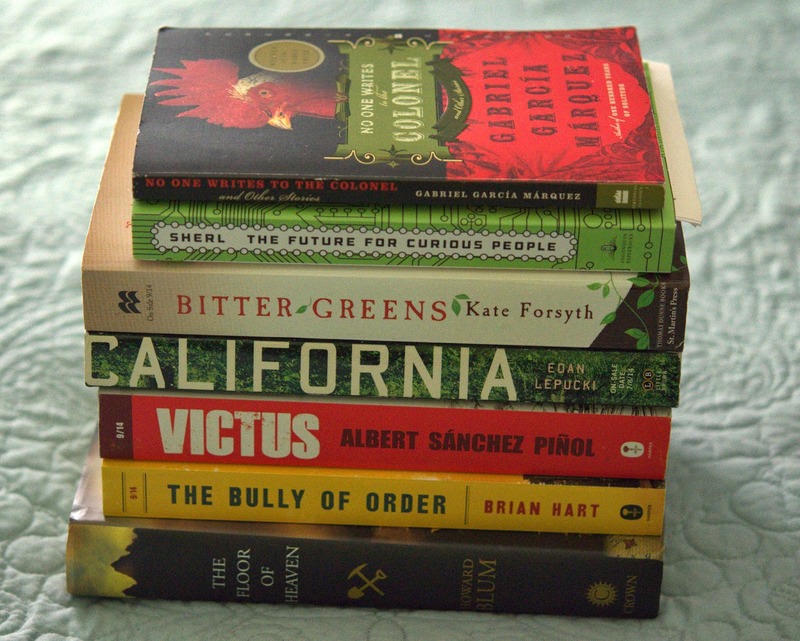 I'm not sure how I managed to skip the Fact or Fib books when I was reviewing but May was a rough month. I loved almost everything I read (with only one exception) but it was probably because I read so many fabulous books in a row that I went through a miserable book slump. Favorites were We Were Liars, All the Birds, Singing, Echo Boy and Anton and Cecil. I included a DNF in my June list because I took the time to write a post, although I'm Nobody was not the only book I set aside. Traveling gave me some extra reading time, both on the plane and sitting on my son and daughter-in-law's breezy porch. 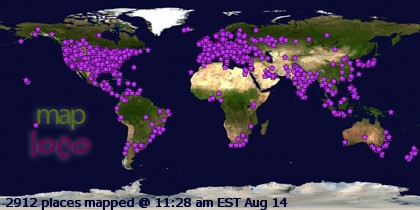 Favorites in June were Half Bad, The Humans, World of Trouble and In the Sea There Are Crocodiles. I also enjoyed rereading Time and Again and The Longest Way Home, both favorites from past years, and thought the newest Nick and Tesla book was the most entertaining in that series, so far. Tales of Trenzalore was also a great escape. I will try to remember to update this post with links as I review the books I haven't gotten around to reading, yet.